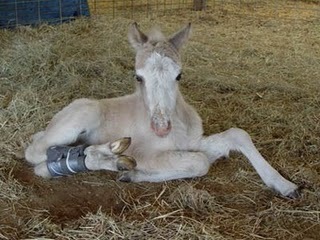 Feb. 22, 2009 Our first miniature horse foal of the year was born early this morning. A pretty buckskin colt with overo markings. Unfortunately, his back legs are badly twisted. 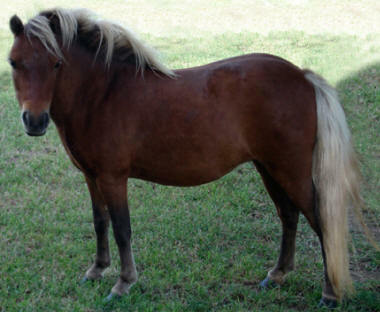 This is a first in our fifteen years of breeding minis. Some quick googling found lots of results, apparently uterine malposition is the most common reason given. 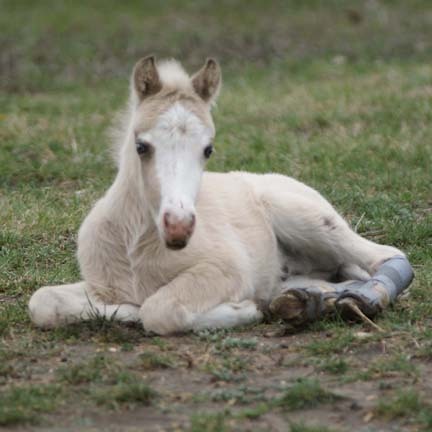 Sometimes the foal become twisted or "stuck" in an awkward position in the limited space of the uterus, and they can't stretch their limbs and move about. These abnormally positioned legs develop tightened or shortened ligaments and tendons. 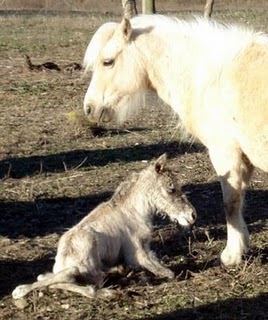 Mom Jasmine is not a small mare and has had several fine healthy foals here at Unicorner Farm. So I guess it can just happen, nothing else has changed. Bob called our vet and he told us basically the same thing and agreed with the articles that the prognosis is good for the legs to straighten and be normal in time. 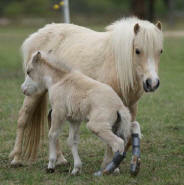 Though the colt cannot nurse yet on his own, he is strong and gets around by scooting. It is very sad to watch him try to get up in the stall but over the past 12 hours he has improved quite a bit. We have seen a lot more flexibility and he sure looks forward to his bottle. Jasmine is a great mom and doesn't mind being milked and is very careful around him. Bob has named him Trooper because he doesn't give up. 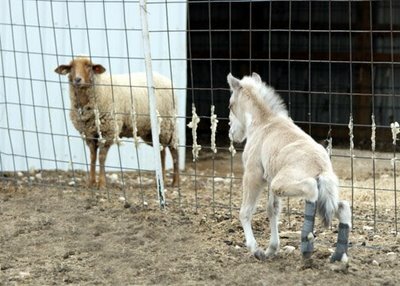 Hopefully he will soon be able to stand to nurse by himself. A little good news this morning, Trooper seems to be learning to stand with the help of some padded braces on his back legs. When I went to help him nurse (he just needs to be steadied and he can do the rest) he didn't seem to be as hungry as normal. After a few sips he was satisfied, and a little later while I was checking on the ewes in the barn I noticed he stood up when his mom came over to check on him. Apparently he has been helping himself! That is encouraging! ANOTHER TROOPER UPDATE: When I got home from work and did my barn check... here is what I found. I know he looks strange but he has come a LONG way since Sunday. 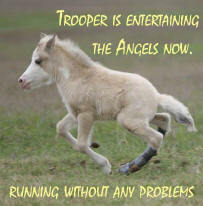 Trooper is two and half weeks old now and we are seeing small improvements each day. He is getting stronger and his legs are doing much less twisting. We are allowing him more exercise now and here he is exploring a larger paddock next door to one of the Tunis sheep pens. We are experimenting with leaving the splints off more of the time. At this point we think he needs to exercise his pasterns more and he is starting to come up on them now. He is very curious about everything, including his Tunis neighbors who were in the yard grazing when we took him out for a walk. After exercise he got lots of good scratches from Bob while mom Jasmine watched enviously. (She got some too later). Bob and I sure do appreciate all the support and well wishes from all of Trooper's "fan" club. He is still improving though it seems so slow. But when we look back at the photos we can see how far he has come. He was five weeks old yesterday. 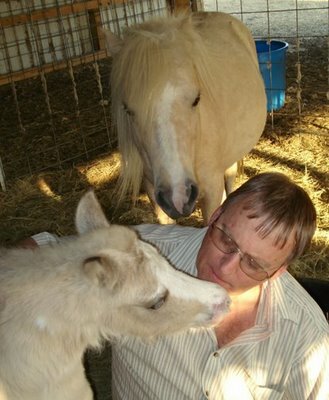 Trooper has been hurting really bad, apparently colic, which is a bad stomach ache. Since horses cannot vomit, stomach aches can be very serious. We could not reach our vet until this morning. He finally called and apologized, his phone did not alert him to Bob's calls last night. Bob and Trooper are now on their way to the vet so I will update the post as I find out more info. I had to come to work. Bob just called, Trooper has lockjaw... tetanus! That is a first for us, we've always heard of it and we give all of our animals tetanus shots if they have surgery or such. The lambs always get a tetanus shot when they are banded. But Trooper hasn't had one. 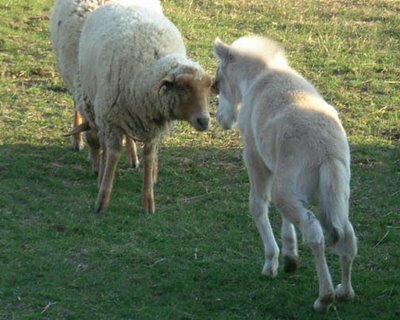 Guess we will have to include those on foals from now on. Dr. Edwards says if he keeps eating the prognosis is good. He will have to have 5 shots today and tomorrow. Tetanus toxemia is caused by a specific neurotoxin produced by Clostridium tetani in necrotic tissue. 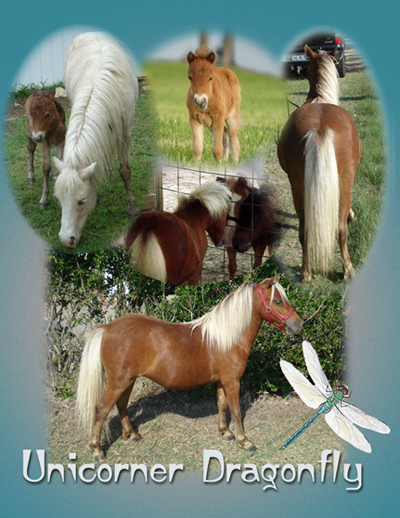 Horses are the most sensitive of all species, with the possible exception of humans. The incubation period varies from one to several weeks but usually averages 10-14 days. Localized stiffness, often involving the masseter muscles and muscles of the neck, the hindlimbs, and the region of the infected wound, is seen first; general stiffness becomes pronounced ~1 day later, and tonic spasms and hyperesthesia become evident. The reflexes increase in intensity, and the animal is easily excited into more violent, general spasms by sudden movement or noise. Spasms of head muscles cause difficulty in prehension and mastication of food, hence the common name, lockjaw . 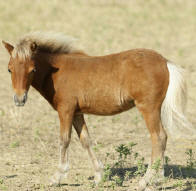 In horses, the ears are erect, the tail stiff and extended, the anterior nares dilated, and the third eyelid prolapsed. Walking, turning, and backing are difficult. Spasms of the neck and back muscles cause extension of the head and neck, while stiffness of the leg muscles causes the animal to assume a “sawhorse” stance. Sweating is common. General spasms disturb circulation and respiration, which results in increased heart rate, rapid breathing, and congestion of mucous membranes. Usually, the temperature remains slightly above normal, but it may rise to 108-110°F (42-43°C) toward the end of a fatal attack. In mild attacks, the pulse and temperature remain nearly normal. Mortality averages ~80%. In animals that recover, there is a convalescent period of 2-6 wk; protective immunity usually does not develop after recovery. Trooper is having a really tough time. We are really starting to worry. Doc prescribed muscle relaxers for his spasms and it really knocks poor Trooper out. There was a time last night that Bob was really worried he wasn't going to wake back up. And when the Ace does start wearing off Trooper's heart rate goes up and his breathing gets too fast again. It is hard to find a happy medium. Trooper had his second big tetanus anti-toxin shot this morning. So we pray that he will start to improve. His jaw totally locked during the night so getting him to eat is difficult, Bob milked Jasmine and is giving him a little at a time. Bob took another day of vacation to stay home and do what he can to keep Trooper comfortable. We appreciate everyone keeping Bob and Trooper in your thoughts and prayers! 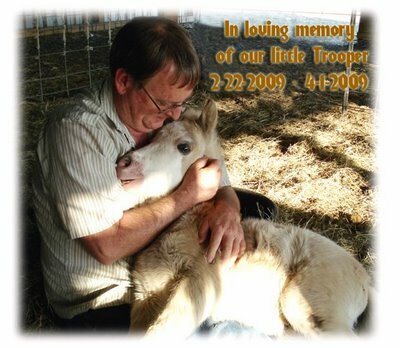 At 1:05 p.m. Doc and Bob had to make the decision for our dear little Trooper, he still would never quit.